"YOU must be earnest," quips the young venture capitalist (VC) at Alsop Louie Partners in Silicon Valley, in response to the question, what makes her tick. "My name is Ernestine," she adds after a brief pause. When Ernestine Fu joined the San Francisco-based VC firm in March 2011, she was only 20 years old, making her the youngest VC in Silicon Valley. Within two months, she was leading her first investment, and in August of that year, the then Stanford undergraduate made it to the cover of Forbes magazine. Those are some admirable strides considering that when Ms Fu first joined Alsop Louie, she marched into its weekly meeting armed with a list of classmates. After all, one of the first things she noticed when she started at Stanford was that a lot of schoolmates were entrepreneurs and trying to start a business. "One of the challenges of starting at a VC is not knowing anything about it. I thought it was about throwing money at entrepreneurs," she says with a laugh, to a roomful of entrepreneurs, venture capitalists and social entrepreneurs. Ms Fu, a DBS BusinessClass adviser, was the guest speaker at the launch of "The Bay Area Series" last Friday, where she shared the secrets of her success and how startups in Asia can replicate it. She quickly learnt the ropes. One of the key things you look for when funding a company is the team, she says, in between anecdotes. "Many people can propose the same idea and the same product but the team must be able to deliver. (The second key thing) you look for when funding a company is the market. A top company in the smallest market is not as great as a top 10 company in a large market. So market is very important." Earlier this year, Ms Fu - and her team of four other members - sold their two-month-old location-sharing startup HelloWorld to Life360, which develops smartphone applications that keep families and close friends connected, for an undisclosed seven-figure sum. If the figure itself is not impressive enough, how about this - HelloWorld was born out of a Y Combinator hackathon in August. "One of the main things we focused on very heavily is creating an app we really wanted to use. Being able to create a product people actually wanted to use helped us gain a lot of users very quickly. We also had an extremely strong team," she says. Between the five of them, the team was able to boast engineering experience in open source work and having done art design for Warner Brothers. "What was really helpful for us is I had a friend who worked at TechCrunch so he helped announce the launch of the app," adds Ms Fu. "Having key partners is important." At the moment, Ms Fu is not looking at anything beyond HelloWorld, in terms of the app-creation and entrepreneurship space. But she is, she's quick to add, "always full of ideas" in terms of what apps should be created. "The entire HelloWorld incident was a bit accidental in that I definitely did not expect it to get acquired, definitely did not expect to have so many users on it. 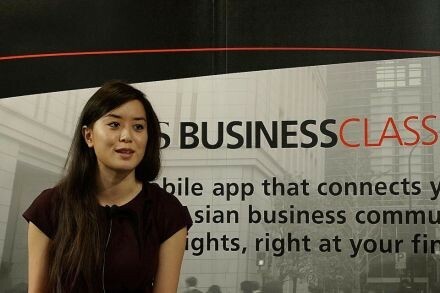 And I think that's also one of the key things about entrepreneurship," shares Ms Fu, in a one-on-one interview with BT. "It's not saying I want to start a company; should I do it in (the) healthcare, cleantech, enterprise or consumer (space)? But actually consistently just thinking about what are the different needs in society and is there actually something I can create that addresses it. So that comes more naturally, in terms of seeing the problem, and finding the startup and solution that can solve it." If you think this sounds like the musings of a social entrepreneur, it is not far from the truth. While still in high school, Ms Fu started a non-profit organisation, Visual Arts and Music for Society. What started as a group of 10 volunteers visiting hospitals, senior-care centres and homeless shelters, started taking a life of its own one year in. "I was part of a youth orchestra within the community so there were students from different high schools, and when they heard about (the volunteer work) they were like oh, we want to do something similar with our high school. So once there was more interest we decided to formalise the structure and create a non-profit out of it." She continues: "In high school, at an early age, I started a non-profit. I think that was very important because from an early age I learnt, as I was scrambling to get the non-profit set up, how to file tax forms as well as how to create a board of directors. Because when I wanted to open a bank account they said you have to have a constitution and have the board of directors approve this opening of a bank account. "So having that experience early on was very helpful and it's something that was completely unexpected . . . The key thing is, it wasn't me thinking I need to have an entrepreneurship experience at an early age, but it all happened and I had incredible mentors that encouraged and helped me along the way." Indeed, the question of how to foster entrepreneurship was a common theme during the Q&A session. Beyond having a strong foundation, it is important to create "conversations" about entrepreneurship, says Ms Fu. And Singapore has the building blocks in place with a government that is pro-entrepreneurship. "What's really exciting is that the government in Singapore is strongly advocating entrepreneurship and supporting that. That's key because you need to have large institutions supporting it. So for example the government (and) DBS is also supporting it. And that's important because you typically have a lot of large institutions just hindering entrepreneurship and trying to prevent it from happening. That's one thing Singapore has been doing really well." On the flip side, the venture capital community in Singapore is filled with investors that come primarily from private equity background, so they have not necessarily started their own company, notes Ms Fu. Within Silicon Valley, on the other hand, the investor demographic is tilted more towards people who have already started companies or worked at startups. "Bringing that experience to entrepreneurs is important just because it's not just about financial capital but the intellectual capital and providing that support," says Ms Fu. Looking into 2015, Ms Fu says entrepreneurs here should leverage technologies already easily available to make inroads in the 3D printing and wearable devices space. "With 3D printing, I'm a huge believer that all the different industries will transform," says Ms Fu, citing the food, medical and military industries. In the wearable-technology space, the next challenge will be creating wearable devices that are user-friendly and that consumers will enjoy using. "A lot of fashion companies are (working with companies which deal in) wearable technology now. I think 2015 is the year when we see beautiful wearables," she says.